Mobile technologies are often hailed as a way to “give voice to the voiceless.” Behind the praise though are beliefs about technology as a gateway to opportunity and voice as a metaphor for agency and self-representation. 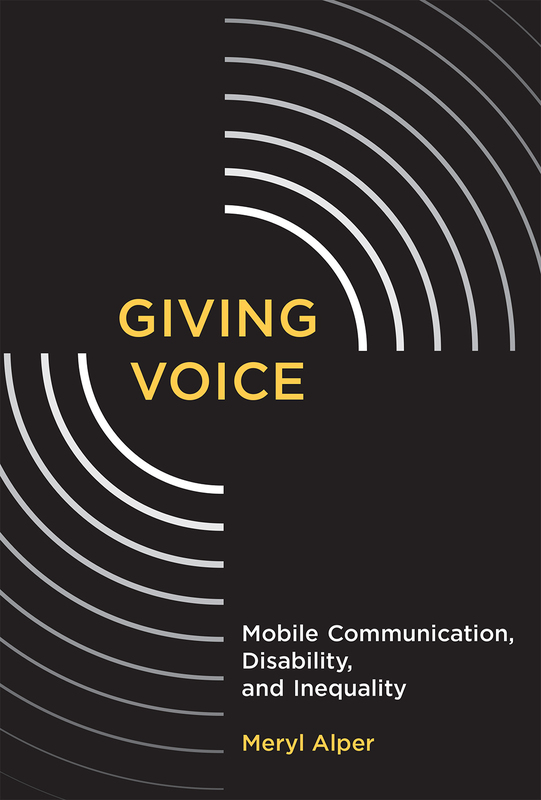 In Giving Voice, Meryl Alper explores these assumptions by looking closely at one such case–the use of the Apple iPad and mobile app Proloquo2Go, which converts icons and text into synthetic speech, by children with disabilities (including autism and cerebral palsy) and their families. She finds that despite claims to empowerment, the hardware and software are still subject to disempowering structural inequalities. Views of technology as a great equalizer, she illustrates, rarely account for all the ways that culture, law, policy, and even technology itself can reinforce disparity, particularly for those with disabilities. Alper explores, among other things, alternative understandings of voice, the surprising sociotechnical importance of the iPad case, and convergences and divergences in the lives of parents across class. She shows that working-class and low-income parents understood the app and other communication technologies differently from upper- and middle-class parents, and that the institutional ecosystem reflected a bias toward those more privileged. Handing someone a talking tablet computer does not in itself give that person a voice. Alper finds that the ability to mobilize social, economic, and cultural capital shapes the extent to which individuals can not only speak, but be heard. If interested in having me talk at your university, organization, or group, please email m.alper@northeastern.edu. Culture Digitally. Author Interview: Meryl Alper on “Giving Voice.” June 7, 2017. DML Central. Watchworthy Wednesday: New book questions tech assumptions. January 25, 2017. Northeastern University, College of Arts, Media and Design. New book by communications studies professor hits shelves. January 23, 2017.